I was so lazy this weekend because of the heat! 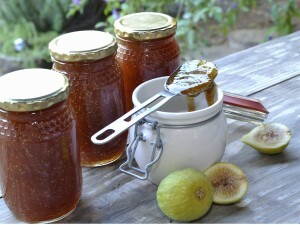 But I did manage to eat myself sick on fresh figs and I collected over 5kg to make jam! I’ll bring some for you when I come into town this week – AND fresh figs too! At sunrise, the local birds make a helluva racket eating the ripe figs. I now have the best solution – I bring out the feather duster and shake it at them through the bedroom window! They flee from my makeshift hawk! Heehee! So I can harvest lots and lots of figs! I need to get new recipes where I can use figs! Do you have any? Oh they are so nice these jars! Marion bought them for me for my birthday years ago. I think they came from the craft market where she has a stall for her handmade scarves. I’ll ask her. Hey Barbs, where do you get those jars from? The white one in the photograph? I’ve looked for them all over and can’t find any. I will ask Stefani if she has any suggestions or recipes for Figs!